Diplomats at the UN and IAEA have proposed reclassifying uranium as a “critical material.” That would allow countries to tap funding from the World Bank and other development institutions to ensure supply under the guise of the UN’s sustainable development goals. While the change could potentially cut mining waste, it might also lead to a reduction of the scrutiny uneconomical projects get from nuclear inspectors. “The main use of phosphate is in fertilizer, but it can also contain a lot of uranium,” said Harikrishnan Tulsidas, a UN official and former IAEA mining adviser who was one of the proposal’s authors. 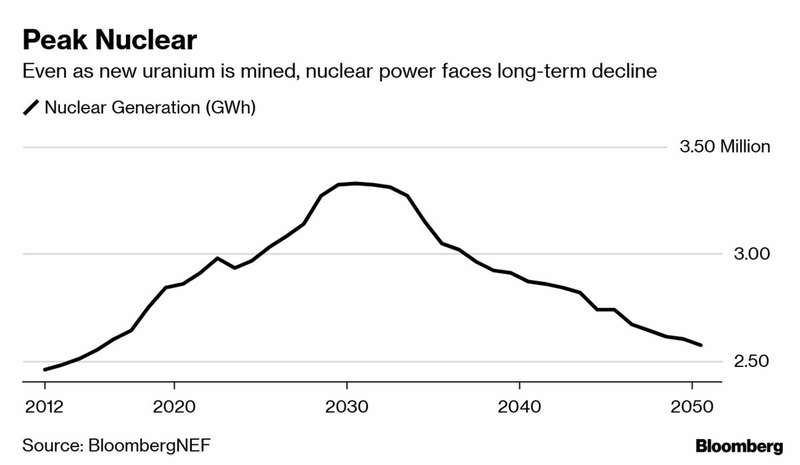 By turning uranium into a byproduct of phosphate, the nuclear industry could blunt “boom-bust” mining cycles by linking uranium supply with other industries, like agriculture, he said. Strong links between phosphate and uranium emerged as far back as the 1950s in the U.S., according to a Stockholm International Peace Research Institute report co-authored by Vitaly Fedchenko. America’s earliest nuclear arsenal used uranium derived from a fertilizer plant in Florida. Countries from Israel, India and Pakistan have also looked to phosphate as a way around import restrictions for atomic material, according to Kelley, who called the method “a sore on the non-proliferation landscape.” His assessment of the site in Syria was triggered by concerns of John Bolton, who is now the national security adviser to U.S. President Donald Trump. Though in its elemental form uranium can’t fuel a reactor or make a bomb – it first must be enriched or turned into plutonium — it’s the fundamental ingredient for all nuclear programs. BHP Group Ltd.’s Olympic Dam is currently the world’s biggest uranium mine. Morocco’s OCP SA sits on the largest quantity of the heavy metal, buried in the kingdom’s vast phosphate reserves. One of the countries pursuing recovery of phosphates and uranium is Saudi Arabia. Energy Minister Khalid Al-Falih said a year ago that the kingdom possesses “significant uranium reserves” that it intends to tap, but which haven’t been accounted for by international monitors. Saudi Arabia also has plans to mine phosphates, which it estimates could be as high as 7 percent of the world’s reserves. Saudi government officials had no comment. 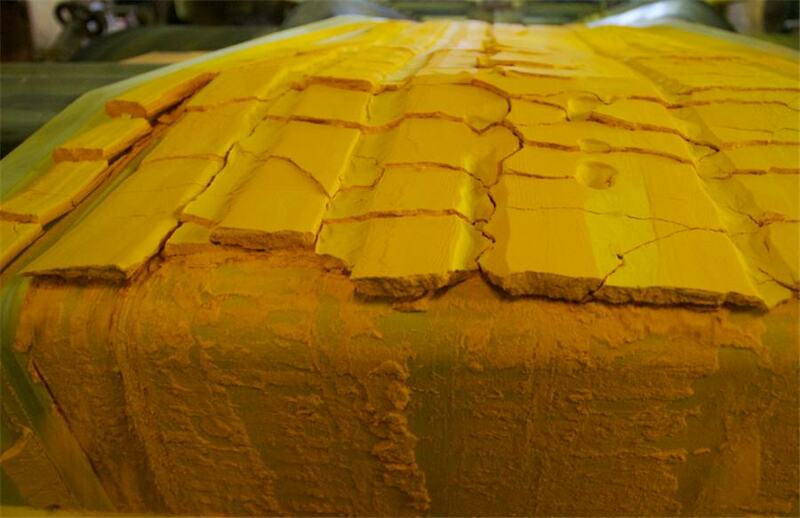 The state-backed producer, Saudi Arabian Mining Co., brushed aside the idea that the kingdom’s phosphate could be a major producer of uranium. The kingdom is pursuing nuclear power but has also has warned it could seek weapons too. 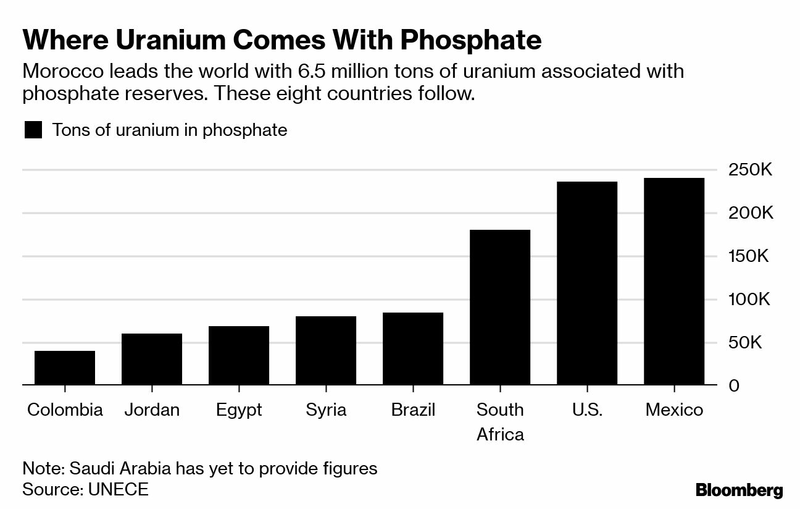 Saudi Arabia is unique among countries with the potential to extract uranium from phosphate: it’s flush with oil money to invest and has signaled an ambition to build a nuclear program. The technology needs big financial backing. Commercial plants cost as much as $1.3 billion, according to Julian Hilton, who advocates for “green nuclear fuel sources” and helped draft the UN’s new guidelines. The risk that uranium is diverted for weapons could be reduced if countries adopted stricter international rules to safeguard uranium stockpiles. But implementing tougher rules, what the IAEA calls an additional protocol, aren’t required as a precondition to get aid in recovering uranium from phosphate, according to IAEA Director General Yukiya Amano. That’s a concern among non-proliferation experts because of the IAEA’s checkered past with uranium. The agency helped Pakistan develop resources that likely went into that country’s weapons program. In Syria, under investigation since 2007 over clandestine nuclear work, the IAEA helped build a pilot extraction facility at a fertilizer plant in the city of Homs. Based on current prices, it’s cheaper for countries that want nuclear power to buy uranium on the market than it is to invest in new exaction. Over the last decade, the market for reactor fuel has been battered by safety concerns, cheap natural gas and the shift toward decentralized electricity grids powered by renewables.